How to add a Scheduling / Appointment / Booking system to my Weebly website? Our support center often got this question : is it possible to add Sagenda booking system into my Weebly website? The answer is “Yes”! 2. Copy the HTML code from your Dashboard (click the button or select the text and copy-it). 3. 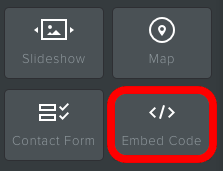 From your side bar in “Individual Elements”, click “show all elements”, please drag and drop the “Embed Code” element into the desired location. 4. Click on “Edit custom HTML” and paste the previously copied iframe into the Custom HTML section. 5. That’s it! Just make sure to save you changes and publish your site. Read more about iFrame integration on Weebly website.